More people than ever before are talking about butterflies, especially monarch butterflies whose population is on the decline for a number of reasons. We encourage you to read and learn more about butterflies and how you can support them in your own garden. Butterflies are fascinating creatures! They have very different vision than humans. They have compound eyes which are comprised of thousands of tiny ommatidia, which makes them see in mosaics instead of a single, clear image. This helps them to see in all directions at once to easily detect predators or food sources. They can also see a much broader spectrum of colors and patterns, including UV light. Most cannot see the color red, though a few species have developed the ability to differentiate between red and green. 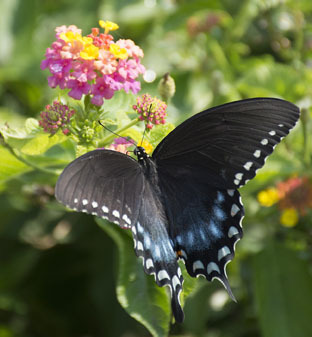 Butterflies are cold blooded, so they need the warmth of the sun to regulate their body temperature so they can fly. When you are planting flowers for butterflies in your garden, plant them in a sunny place that is preferably sheltered from strong winds. Butterflies maintain an all-liquid diet, drinking nectar from flowers and water from shallow pools of water with their straw-like proboscis. Flowers that provide nectar are listed below. You can also supplement their nutritional needs with butterfly feeders filled with a sugar water solution.